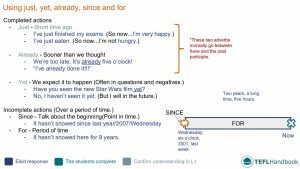 A B1 level ESL lesson plan containing activities and games for teaching just, yet, already, since and for with the present perfect. Use it as a stand-alone lesson plan, or to supplement an existing one on a similar or related topic. The recommended way to view these materials is through the TEFL Handbook app, which gives you offline access to all of the teaching resources on this site. The board work below is one example of how we could introduce and explain the usage of just, yet, already, since and for. Step through each of the time modifiers, highlight their functional uses and elicit examples from the students. 1. Jen hasn’t been to a basketball game _____, but she really wants to go. 2. Peter has _____ left for the station. 3. I haven’t talked to my mother _____ two weeks. 4. Mark has told me he’s _____ been to that museum. 5. Kevin hasn’t been at this school _____ very long. 6. Have you finished painting the house _____? Once they have finished, they should check their answers with a partner. 1. Three things they have just done. 2. Three things they want to do, but haven’t done yet. 3. Three things they have already done. Once they have finished, have them swap books with a partner. Now, using their partner’s table, students will ask follow-up questions to find out more information. Tell them to get as much information as possible as they will have to report to you later. Demo this with another student first. After the interviews, they will report back to you on each item. Ask them any follow-up questions that you think they should have asked. If they don’t have the information, you could have them ask their partner and report it back to you. Bucket list: A list of experiences or achievements that a person hopes to have or accomplish during their lifetime. This excellent ESL speaking activity nicely blends the target language of this lesson with some other areas. Start off by eliciting or explaining the meaning of a bucket list on the board and tell the students to create one (10 items is enough). Next, students swap books and take turns interviewing each other. The interviewee must pretend that they have already done 5 of these things. The interviewer should ask follow-up questions about each item. Demo this with another student first and teach some follow-up questions for affirmative and negative responses. Tell the students to remember their partner's answers because they will be quizzed on them later. Teacher: So Victor, did you learn anything interesting about Susan? On each turn, a student will come to the front of the class. That student must think of a specific time in their day, limit it to half hours. The other students take turns asking a question and attempting to guess the time. Student A: Have you been to school yet? Student B: Yes, I have. Student A: Is it 4:00? Student B: No, it isn’t. Student C: Have you already eaten dinner? We hope that you've found a few of these ideas useful. 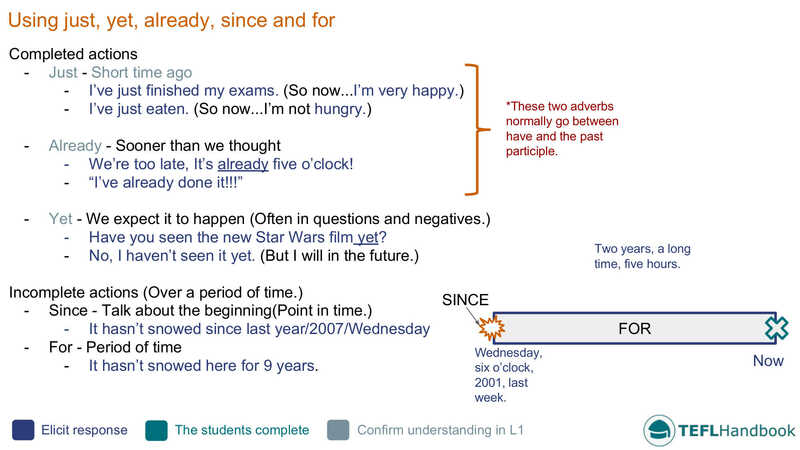 Our suggested next lesson is on using conditionals. Be sure to check out our complete list of intermediate level ESL lesson plans, as well as our entire collection of ESL lesson plans. Also, if you're an iOS or Android user, this lesson plan is available for free on the TEFL Handbook app. An ESL lesson planner for English teachers.